When the original Call of Duty was first released, the had a big impact on both consumers and critics alike, and it quickly rose to become one the top games in its class. Call of Duty did this by having well-designed campaigns and an intuitive feel, complemented by immersive sound effects and an enjoyable multiplayer option. Call of Duty 2 not only stays true to these strengths but has improved upon many other aspects of gameplay as well. If the original Call of Duty left you wanting more, this sequel will more than satisfy your hunger. Fight off waves of invading German troops and Panzer tanks in Moscow. View larger. Race around in your own tank with others at your side in North Africa. View larger. Scale the cliffs of Pointe du Hoc with the Army Rangers. View larger. Just as in the original, Call of Duty 2 has you working your way through WWII across three interwoven campaigns. As a private in the Russian army, you will fight off waves of invading German troops and Panzer tanks in Moscow and Stalingrad. Once you finish the Russian campaign, you'll go up against Field Marshal Rommel's troops in the deserts of North Africa. As part of this campaign, you'll race around in your own tank with others at your side, and later you'll be tasked with calling in air strikes against enemy tanks. The final campaign has you in the role of an American corporal in Europe, but unlike most WWII games, you won't perform a D-Day landing on Omaha or Utah Beach. In Call of Duty 2, you have to scale the cliffs of Pointe du Hoc with the Army Rangers amidst a hail of artillery and machine gun fire, giving you a true appreciation of the time-honored saying, "War is Hell!" Call of Duty 2 is a thinking-gamer's first-person shooter of medium difficulty. While there are many reflexive elements, the game quite often requires you to consider the tactics of the situation in order to survive. While you can probably blow through the game in 10 hours on the regular setting, the more difficult settings require you to be much more thoughtful about your approach to the different scenarios. Your teammates in battle neither finish your fight, nor simply provide enemy fodder, while the enemy AI (artificial intelligence) is quite clever. If you are too meek, you will find yourself pinned down by aggressive fire while the enemy lobs grenades at you until you're decimated. Unlike the its predecessor, Call of Duty 2 doesn't give you a health bar. Instead, as you are hit by more and more fire, your screen grows increasingly red around the border, and your character begins to grunt and pant. This is your signal that it's time to find some cover in order to recuperate before you continue. Another major improvement is the enhanced smoke grenades, which not only look great but can be used effectively in battle to obscure your path from tanks or machine-gun nests as you make your way to an objective. While Call of Duty 2 has received an ESRB T (teen) rating -- meaning there are no gratuitous blood and guts splashing all over the screen -- this is still war, and there are enemies that will try to drag themselves to safety after being hit, only to be bludgeoned to a screaming death by your fellow men-at-arms. And like its older brother, Call of Duty 2 offers the standard deathmatch, team deathmatch, capture-the-flag, and search-and-destroy multiplayer modes. However, this version offers a new option called "headquarters," which most closely resembles the "crazy king" version of king-of-the-hill in Halo 2. Shifting headquarter points appear and must be captured in order to start building points, only to be overrun by the other side in order to halt that point gain. This version of the multiplayer mode is not only extremely fun, but it requires teams to adapt on the fly. Unlike the original, in this sequel you can skip forward from one mission to the next once you've cleared a campaign. The game also auto-detects 16:9 and 16:10 wide-screen ratios, as well as the sometimes tricky 5:4 ratio for LCD monitors. As the user, you can make use of a good set of performance tweaking functions, or you can allow the game to determine the optimal ratio, based on your system. 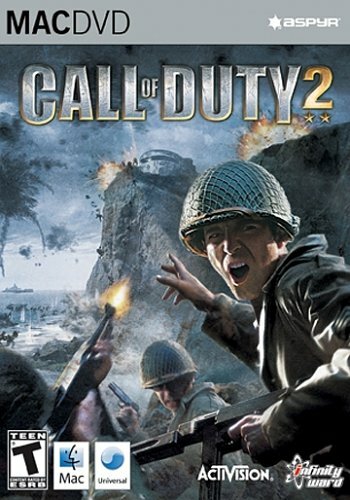 With the addition of actual war footage as introductions to each campaign, and famous war quotes at the end of the scenes, Call of Duty 2 has everything you need to lose yourself in the middle of the biggest war in history of the world. I loved Call of Duty and I love this game too. I love how real it is and how challenging it can be to make it through levels. Recently made the switch to Mac- played this on an intel imac 20. Its my first made-for-mac game. No technical/performance issues whatsoever (didn't use multiplayer features). Even tried setting all gfx options to highest possible settings- still no problems. Greate game, BUT not up to date! Well, I'm not a fan of shoot'em up: I rather prefer to play the realistic Battlefront's Combat Mission, or Shanghai! But I'm a wwii buff as well, so I was intrigued by COD and expecially about the sets and the 3d graphics: some of those missions were too much doom-like, tanks were too much fancyful and other moments were plainly too arcade like, but fun! This new sequel is more realistic, somehow: there are no labirynth like missions, the FX improvements are great, both graphics as for the mechanics of the game; to conclude I'm running the game on a DP 1 GHz quicksilver, Titanium GeForce and 1.5 GB RAM: a good system, but not up to date technology; still I can enjoy the game smoothly and at full option, almost. Call Of Duty 2 IS AWESOME!!! Works find... but rather have a bigger screen. Some sluggish, when loads of bullets flying through... Recommendation, get the minimum of 15" with at least 1GB RAM. Call of Duty 2 is the most entertaining game I have experienced on the Mac - much better than Doom 4, Alien vs Predator, and Halo. CoD2 is the best FPS game on Mac! Have had this game and now that it's been updated to 1.3 with punk buster it's the best fps game out for mac. Cons: only it took Aspyr a couple months to get the 1.3 ported but worth the wait. Amazing graphics and story line. I found this to be a fairly entertaining game on my Mac. The graphics during the game are really well done. Some minor glitches although very realistic. The small movie klips in the beginning of chapters are very well done and ensure you get an idea of the history of WW2. The surround sound is quite amazing as if you were on the war path, using head sets really helps the environment of the game. If you are into was games and enjoy first person shooting this game is for you. I played in the hard level and if you are no used to the mouse and keybrd combo get yourself a mouse. Also recommend you get a mouse with two button as a single button would be a disadvantage. Demo runs well; think full version will on my powerbook g4? I was curious if anyone knew if CoD2 ran well on a powerbook 64 (1.67mhz, 1gig, Radeon9700); while i do not meet the specs on aspyr.com, the demo runs surprisingly well on my powerbook, so I was hoping the full version did too. Call of Duty 2 was a lot of fun as a game, but there were a number of disapointing aspects to the implimentation that stopped it from being a 5 star experience. I really enjoyed not needing to search for health packs all the time and the generous restart points. It made the gameplay much more fluid and helped to avoid getting frustrated. The missions were about the right level of difficulty and were very clear about the goals. There were rarely points where I was confused about where I needed to go or what I needed to do. My favorite levels were the tank missions in the desert and the assault on Hill 400. Sound was ok, but I didn't find it to be anything amazing. Graphics on the other hand were beautiful. I was able to play at 1050 x 1680 with anti-aliasing at 2x and only really experienced any slowdowns when I needed to run through smoke. The game trapped and ignored the Command-Tab keystroke so you couldn't pause the game, switch to a different application and come back. This became frustrating if I got an IM while playing and wanted to quickly see what it was. The only way to do this was to get to a known save point and quit. It also took control of the second monitor, but would only allow it to be blacked out. Once again the ability to context switch would have been nice. The game should have either used the second monitor (e.g. expand the person locator, show ammunition status, or mission status) or it should have left it for the OS and allowed context switching. Beyond that, I was quite satisified and am looking forward to CoD3! I had recently played COD and enjoyed the novice and veteran levels. COD2 has better graphics and a much more complex series of missions. I still feel that the game deliberately forces you to die, before "allowing" you to suddenly succeed in any particular situation.